Finally! 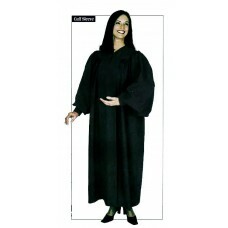 A Basic Minister's robe that not only is high quality, but low in cost. PLEASE...Most clothing orders will be shipped within 4 to 6 weeks at most, however custom orders may take up to 12 weeks for shipment. If you can not wait this length of time for your item, please do not order. We are sorry for the inconvenience. Your credit card will be charged at the time of order, since we must pre-pay our manufacturer to make these items. ALSO... 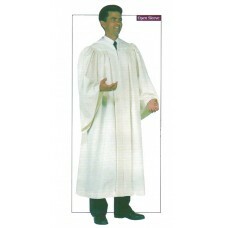 Please place clothing orders separate from any other items in our Ministry catalog. NO REFUNDS OR RETURNS ON CLOTHING except for defectiveness or company error. Shown in the picture is the open sleeve model, but can be requested in cuffed sleeve as well (see ..